It’s been all about the young guns for head coach Coach Quenneville and the Chicago Blackhawks in this first week of the 2018 preseason. So far the Hawks have taken part in three preseason games. While the veterans have gotten their feet wet with some playing time, this week has mostly been a time to assess future talent, as well as see who might be available to contribute right away. Here’s an overview from the first week. But of course just the scores doesn’t assess the whole picture. There are a number of ongoing storylines from this first week. Let’s take a look at a few youngsters who are standing out. It was announced last week that defenseman Connor Murphy will more than likely be out with a back injury until mid-December. Add this to Gustav Forsling’s wrist surgery, and the door opens even wider for the Blackhawks’ 2017 first round draft pick, Henri Jokiharju. Jokiharju was favored to potentially make the team even before Murphy’s injury. The 19-year-old has been a pleasant surprise throughout prospect camp and training camp. According to Charlie Roumeliotis of NBC Sports Chicago, Blackhawks general manager Stan Bowman had this to say about Jokiharju during prospect camp in July. The biggest jump for him is going to be, can you defend? I think his offensive skills are elite and I was really impressed when I saw him the first time. He trained hard. He looks like an NHL-type body now. In his first preseason game on Tuesday, Jokiharju started the night on the second defensive pairing with Blake Hillman. But as the game progressed, he spent more and more time on the first pairing with Erik Gustafsson. Coach Quenneville was impressed enough to make this statement after the game. Joel Quenneville said that if Henri Jokiharju were to make the team, it'd have to be as an everyday player, not a No. 7. And he doesn't feel that pairing Keith with Seabrook prevents that. Q is more open to Carl Dahlstrom, a slightly older guy, being a rotation guy. On Friday, Jokiharju was on the top defensive pairing with Dahlstrom. He’s also teamed up with top defenseman Duncan Keith during practice. It will be interesting to see where Jokiharju slots in during the second week of the preseason, when the veterans will be getting more ice time to prepare for the regular season. Jokiharju isn’t the only young defenseman making a case for himself. Adam Boqvist is literally one year behind Jokiharju in many ways. 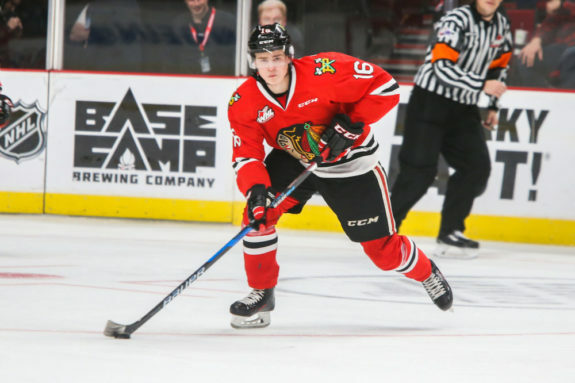 He’s 18 years old, and was the Blackhawks’ first round draft pick this past June. He played in both Tuesday and Thursday’s preseason tilts, logging over 18 and then 22 minutes of ice time in each game, respectively. On Thursday, he played on the top defensive pairing. Boqvist can potentially play in nine NHL games without burning the first year of his contract. Will the Hawks utilize him to start the season, or will he simply be a part of cuts later instead of sooner? Moving on to offense, Dominik Kahun is the latest dark horse candidate to make the team. 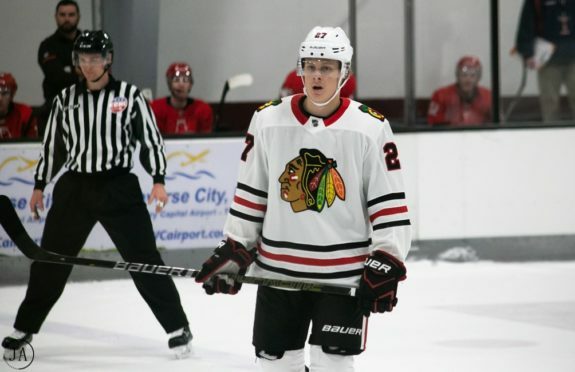 Kahun is a 22-year-old German hockey player who signed a two-year entry-level contract with the Blackhawks in April. He’s wasted no time showing his worth. On Tuesday, Kahun earned the primary assist on Alexandre Fortin’s lone Blackhawk goal of the game. When he suited up again on Friday, Kahun took it a step further, notching a goal and an assist. While his goal was timely in that it knotted the game at 2-2, his no-look pass for John Hayden’s goal was even more impressive. Kahun also took on centering responsibilities in Friday’s tilt. He only won two of seven faceoffs, but Coach Q was impressed nonetheless. Having another option at center could be lucrative for the Hawks moving forward. Goaltender Collin Delia is quite the success story of late. 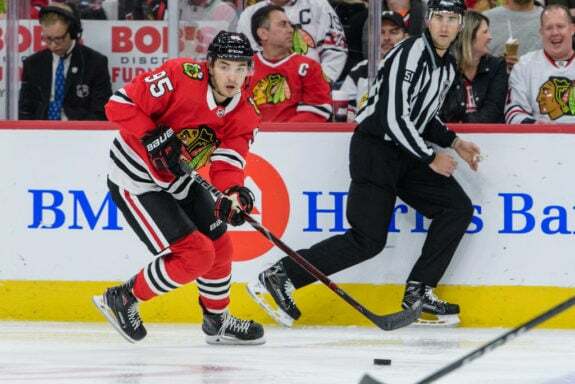 This undrafted free agent followed a rocky path, but came into his own and helped the AHL Rockford IceHogs immensely during their Calder Cup push last season. Delia took the net during the second half of the game against Columbus on Tuesday. He stopped 14 of 16 shots, for a .875 save percentage. Although that doesn’t seem all that impressive, he did shut down six of six shots on the power play. The 24-year-old netminder got the start on Friday against the Ottawa Senators. In 32:22 minutes of ice time he stopped 17 of 19 shots, finding his groove and making some excellent saves. In the interview in the link above regarding Kahun, Coach Q called Delia “spectacular”. 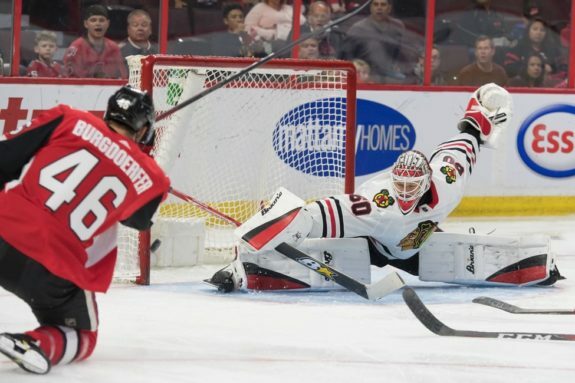 Corey Crawford’s health is still a big question mark. Cam Ward is past his prime and basically just a stop-gap for the Blackhawks. Anton Forsberg remains unproven. If Delia can continue to thrive, he could be the future sooner rather than later for the Blackhawks. With such a young roster on Friday night, two unlikely 28-year-olds sported the “A” on their sweaters to represent their team. Andreas Martinsen only played in nine NHL games last year, and that was after the Blackhawks had given up on their season. Marcus Kruger spent the final part of last season playing for the AHL Charlotte Checkers due to a sports hernia. Kruger is expected to be a lock for the team, but only in a fourth line role. Martinsen is fighting much younger players for a spot. These guys play a grinding, shutdown game. It’s their job to make it as difficult as possible for their opponent to play against them. Yet they contributed even more than that Friday night. In the third period, Martinsen fed Kruger for a goal to make the score 3-2 Chicago. Shortly thereafter, Kruger returned the favor and assisted on a goal from Martinsen. While it’s not necessarily their job to score goals, I’m sure this preseason success helps build some confidence and chemistry between these two underdogs. Forward John Hayden looks strong and full of energy. On Friday he notched a goal and recorded a team-high five shots on goal. Center Luke Johnson is showing he shouldn’t be dismissed just yet. In two preseason games he’s earned a goal and a helper, as well as faring quite well in the faceoff circle. Top prospect Dylan Sikura is expected to make the team, perhaps even in a top-six role. His two-game showing hasn’t done anything to change that. He lined up on the top line for both games, as well as the top power play unit. He contributed an assist on a power play goal Friday. Defenseman Brandon Davidson is still with the Hawks on a professional tryout. As Charlie Roumeliotis tweeted, he was on the ice for 15 shots attempts for and none against on Friday. Could he be a potential fit on the blue line? The Hawks host three more games at the United Center this coming week as they finish out their preseason action. They take on Detroit Tuesday, Ottawa on Thursday, and Columbus this coming Saturday. Look to see a lot more of the veterans as they gear up for the regular season. But keep an eye on these youngsters as they push to make the team!